Looking at the rows and rows of seats, you can imagine a different time. There were thousands of people every night, men in dark suits and hats packed shoulder to shoulder. They’d be waving programs, downing brown booze, smoking cigarettes from cigarette cases or, better still, puffing thick cigars that would fill the room with pungent smoke and give the air just below the giant ceiling lights a ghostly blue haze. As the men on the court used oblong baskets to hurl a goatskin ball over and over against a granite wall, the men in the crowd would be hollering and belly laughing and slapping each other on the back. There was a time when the audience at the Miami Jai Alai fronton was so loud, the players on the court could barely hear their own thoughts. Now though, the seats are almost all empty. On this clear-skied, 85-degree Tuesday afternoon in mid-winter, there are more players in uniform than spectators in the crowd. On the other side of the building, in the freshly renovated casino, there are plenty of people at the poker tables and parked in front of the more than 1,000 flashing slot machines. But in this massive auditorium, once the epicenter of the gambling action, it’s dead. 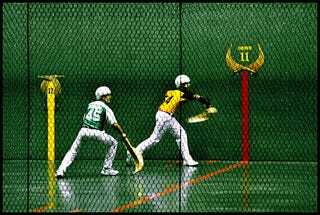 With every throw, you can hear the ball—in jai alai, the pelota—crash against the wall with a thunderous, echoing boom. You can hear the scoreboard beeping, and it sounds like the entire building is on life support. What was once a five-star restaurant at the top of the grandstand, the Courtview Club, is almost always dark and vacant now. The skyboxes, once bustling with young women offering cocktail service, now gather dust year-round. Same for the sectioned-off rows that once comprised the sizable press box. Even the players’ names, they once sounded so exotic and intriguing. Now they just seem … foreign.